Through our long-term Reflective Democracy Campaign, Women Donors Network is calling upon the nation to take a deeper look at the question: Who Leads Us? It’s time for the American people to grapple with how our political leaders can — and should — reflect the talent and experience of all of us. 90% of all elected officials in the U.S. at a federal, state, and county level, are white. Our country’s population is 37% people of color, which means white people have three times the political power as people of color. 71% of all elected positions are held by men, who make up 49% of the population. That means men hold three times the political power of women. 65% of all elected positions are held by white men — more than double their share of the population, which is just 31%. 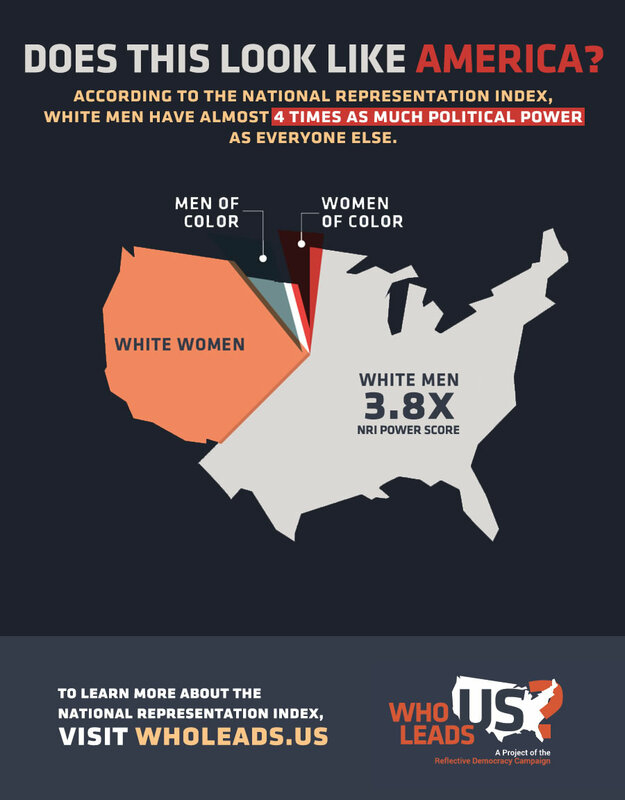 White men hold eight times the political power as women of color. This imbalance of political power is simply not sustainable for a nation that is changing so rapidly. This new resource, and new way to measure progress on whether we have the kind of democracy we want, is available to the public on WhoLeads.Us, which launched this week with a standing-room-only event at the Center for American Progress and coverage in major news outlets including The New York Times, Washington Post, USA Today, Time.com, and The New Republic. This research was complimented by a national poll of 800 likely voters who told us that they see America’s political leadership as an “Old Boys Club,” but would rather see the “Best and Brightest.” People think there are too few women and too few people of color in office, they see the barriers that have contributed to this reality, and — most importantly — they support solutions to address the problem. WDN is focused on making nimble, strategic investments to catalyze change. From here, we will build momentum towards changing the flawed and archaic structures that have blocked progress towards a truly reflective democracy.